Chinese New Year celebration is today! 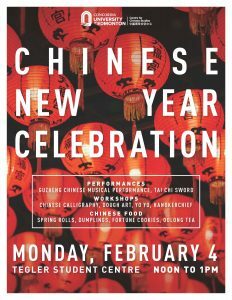 Come celebrate Chinese New Year with us! We’ve got performances, we’ve got workshops, we’ve got food, we’ve got fun – all we need is YOU! Join us in Tegler today between noon – 1 pm for free workshops, performances and food! This event is free and open to everyone. Bring your friends!